Displaced greater tuberosity fx is pathognomonic of a longitudinal tear in the rotator cuff at the rotator interval between the supraspinatus and subscapularis tendons. most common site of injury to the axillary artery is in the third part(named in relation to the pec minor) of the artery at the origin of the anterior and posterior humeral circumflex arteries. Deforming forces: Pectoralis major pulls the shaft medially, anteriorly and internally rotates. Supraspinatus abducts the head fragment. Ensure neurovascular exam has been documentated before surgery. Template prosthesis on preoperative xrays. A/P in the plan of the scapula, axillary and scapular-Y veiws of the normal shoulder are often helpful for templating, especially in 4-part fractures. -Mean distance between the pectoralis major tendon and the top of the humeral articular surface is 5.6cm (Murachaovsky J, JSES 2006;15:675). -Normal distance from the greater tuberosity to the superior protion of the articular surface of the humeral head = 7-8mm (Iannotti JP, JBJS 1992;74A:491), (Takase K, JSES 2002;11:557). -The neck-shaft inclination angle averages 145 degrees. The humeral head is retroveted an average of 30 degrees. Functional outcomes correlate with anatomic restoration of the humeral height, humeral version, and tuberosity position. (Bosch U, JSES 1998;7:479). Must ensure fracture specifc stem is available. Standard TSA stems are associated with poor outcomes. Modified beach-chair position. All bony prominences well padded. Examination under anesthesia of affected shoulder. Prep and drape in standard sterile fashion. Have a well-padded height adjustable Mayo stand or shoulder positioner available to hold the arm during the case. Deltopectoral incision from just medial to AC joint to just lateral to the proximal edge of the biceps muscle belly. Preserve cephalic vein by ligating any branches to deltoid and taking the cephalic vein and its surrounding tissues medially. Incise clavipectoral fascia adjacent to the conjoined tendon up to the coracoacromial ligament. Release upper 1/3 of pectoralis tendon if needed for exposure. Cauterize the anterior humeral circumflex vessels as needed. Identify the long head of the biceps tendon and ensure that it is preserved thoughtout the case. Identify the fracture fragments. The key to identifying the various components is the long head of the biceps tendon. The lesser tuberosity and subacapularis tendon are medial to the long head tendon. The greater tuberosity and supraspinatus are lateral. Generally splinting the rotator interval between the tuberosities provides adequate exposure to the proximal humerus. Mobilize the tuberosity fragments. Tag them with suture as needed. Gently remove the humeral head fragment, being careful to avoid any neurovascular injury. Save head for use as autogenous bone graft. Extend and external rotate the arm to expose the humeral shaft. Prepare the shaft with sequential reamers as instructed the prosthesis technique guide. Determine appropriate head size, version and height to restore normal anatomy. Preoperative templating is very helpful. 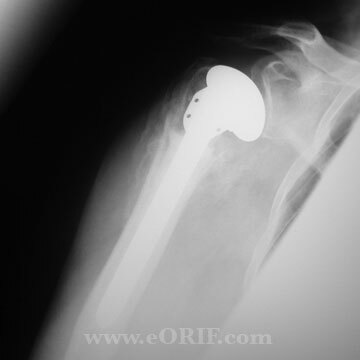 Humeral prosthesis should be 3-5mm above the tip of the anatomically reduced greater tuberosity. Version = 20 degrees retroversion. Humeral head should face the glenoid with the forearm pointed straight ahead in the neutral position. Height = If the medial neck is intact is can be used to reference where the collar of the prosthesis should lie. Head size = Compare the removed humeral head to the prosthetic heads to determine head size. Also reference the preoperative templating. If between sizes, use the smaller size. Place trial components and reduce shoulder. Test AP translation and push-pull tests to assess stability. The head should translation @50% on the glenoid in all directions. Test the retroversion to internally and externally rotation. The shoulder should be stable to 50 degrees in both directions. Place 3-4 holes in the proximal humerus for both the greater and lesser tuberosity repairs and pass #5 nonabsorbable suture through the holes. Repair the tuberosities to the proximal shaft and the implant, greater tuberosity first. Place as much autogous bone graft as possible to improve healing. Augment reconstruction with sutures placed within the rotator cuff. Consider adding a cerclage around the medial aspect of the implant and tuberosities (Frankle MA, JSES 2002;11:413). Poor functional outcome/unhappy triad (excessive height, excessive retroversion, low greater tuberosity postion) (Bosch U, JSES 1998;7:479). Nonunion (Antuna SA, JSES 2002;11:114). Proximal Humerus Fracture Rehab Protocol. Functional results of hemiarthroplasty for fracture are generally unpredicable. 73%-97% good to excellent pain relief; 70%-92% patient satisfaction. (Plausins D JBJS 2005;87A:204). 93% painfree / satisfied with result / shoulder-level function (Mighell MA, JSES 2003;12:569).